It says Synergy quit unexepectedly, click reopen. Reopen does the same thing over and over. My server is a Windows 10 PC 64bit, also connected via Ethernet. Synergy seemed to install fine there. Synergy version installed on each machine @Jen123? Yes, Synergy Basic. The Mac version on the Mac and the Windows version on the PC. I just downloaded both yesterday, so I assume they are the most recent versions. Here's a screenshot from my Windows PC, but I cannot screenshot from the Mac because Synergy will not open at all. 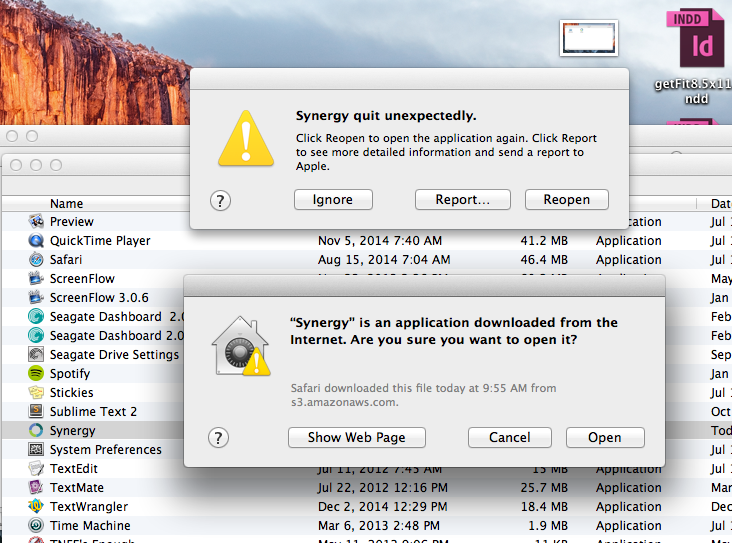 Can you uninstall Synergy on your Mac and install this version instead (download link below)? Still will not open at all. Can you try doing the step mentioned on this comment in Stored serial key corrupted on macOS #5901 @Jen123. I'll give it a try, but I've never been able to get so far as to enter the serial key. This crash happens right after installation when I try to open Synergy for the first time. Hi @Jen123. 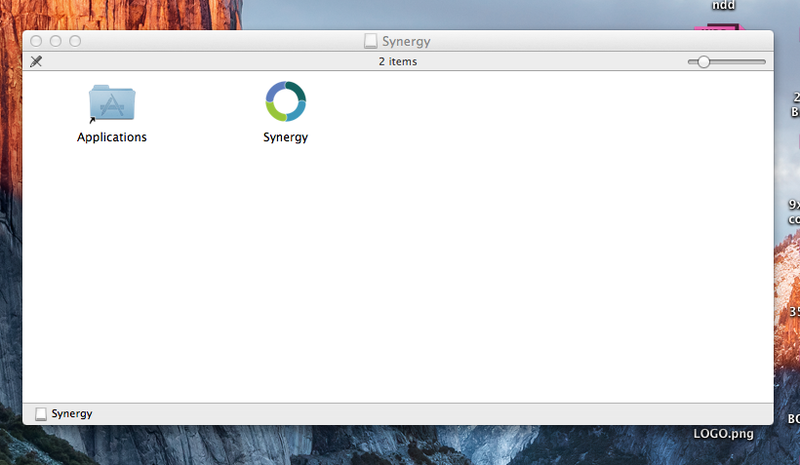 Can you tell me how you install Synergy on your Mac? I downloaded the dmg file. Clicked it to install. 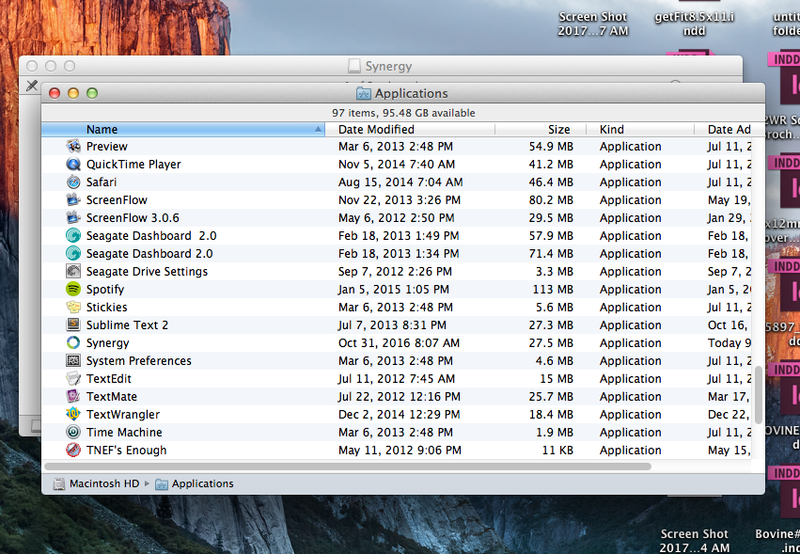 I dragged the Synergy App into my Applications folder. From the Applications Folder I click Synergy and it crashes. Can you post a screenshot of it when you open the DMG file after downloading? Here are all of the screenshots. There's a YouTube tutorial video for Mac installation that we have posted. You can start at 1:31 on Howto install Synergy on Windows 10 and macOS - Installation tutorial. Can you confirm if you've done it the same way as what is shown in that video? I can confirm I've installed 1.8.8 as shown in that video tutorial and for me I get a instant crash on OSX 10.12.5 It doesn't even get as far as showing the above dialogues. No pop ups at all, it just silently closes again. I've just bought this software 15 minutes ago. Installing the earlier version 1.8.5 linked to above did work. Please consider updating your OSX tutorial to include the Assistive Devices location, it took me a while to find it under System Prefs> Security & Privacy> Accessibility. Yes, I have installed it the same way as the tutorial. Like Andydigital said it doesn't get as far as showing the dialogs to enter the activation key. It just crashes immediately upon opening. Version 1.8.8 and 1.8.5 both crash for me. Have you tried it with v1.8.8? Can you share the steps you did to install 1.8.5? I installed it the same way we install anything on OSX, you drag the app to the applications folder and then launch it from within the applications folder. With 1.8.8 when you try to launch it it immediately crashed/vanished without warning. In the tutorial you pointed out earlier it was using a much older version of OSX that didn't require the Synergy app to need access to the Accessibility features of OSX which are more secure now. This new level of security requires that the user specifically whitelist an app allowing it access to lower level functions in the OS. Most other apps I have used that require access to these features tell the user what is required to enable access, you dont, you just tell us to turn it on, most people wont have a clue what you are alluding to as its a very rarely requested security feature. It doesn't help matters that in the latest version of OSX Apple has changed the location of said accessibility menu, its now in Security & Privacy rather than Accessibility as it was in the past, and even I didn't know this and I use OSX all day long lol. Hence the request that you update your tutorial and app installer to reflect this. Apple in the past would have rejected the app for not having said tutorial if Synergy had been for sale through the App store. To answer the second part of your quote, yes I have now tried 1.8.8 and it did install without issue, I suspect something in your new code for 1.8.8 is tripping up at a security check RE the accessibility firewall and whitelisting via 1.8.5 by-passed this bug. I finally got it to work by upgrading my OS to Sierra. Hi there, I've just bought Synergy Basic myself and am experiencing exactly the same issue. It crashes on startup: 'Synergy quit unexpectedly'. I'm running Mac OS 10.7.5 on this computer. The master computer running Sierra has no problems at all. Have you tried using v1.8.5 @tjc888?